Several years ago, my husband and I decided to celebrate our last-ever spring break (as third-year students in law school) by taking a road trip down Highway 1 through the Florida Keys. We flew into Ft. Lauderdale and rented a convertible for the 113-mile drive from mainland Florida to Key West. 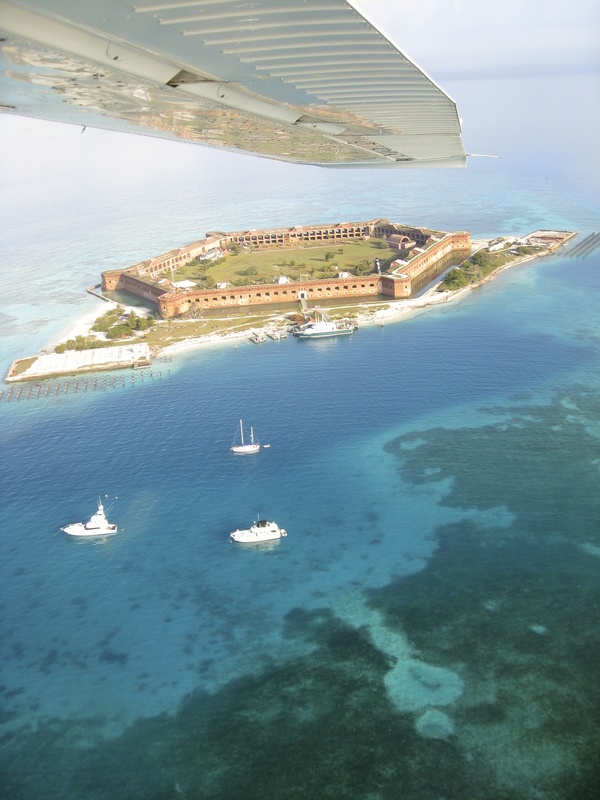 We toured the Keys on jet skis, took a sea-plane to Dry Tortugas National Park, frolicked with six-toed cats, ate ridiculously good food, and enjoyed some amazing sunsets. 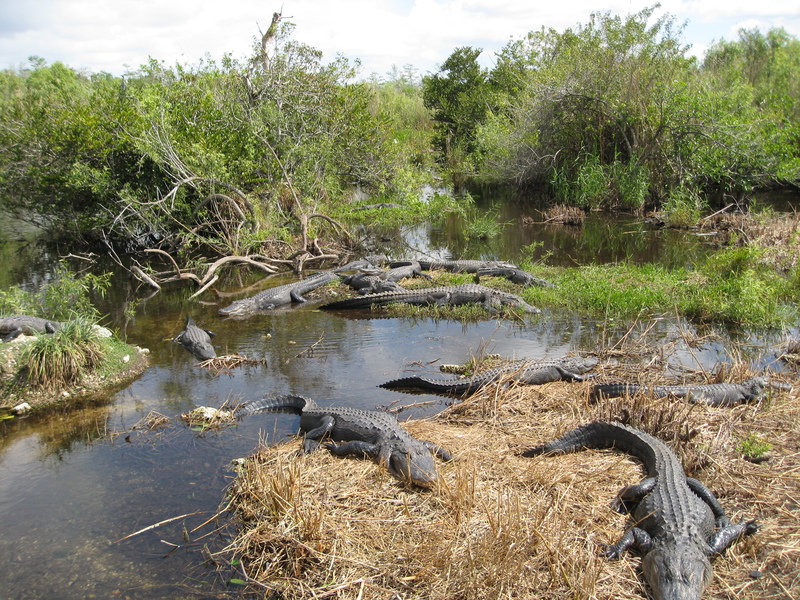 But before we began our trek toward Goombay Smashes at Blue Heaven and the world’s best strawberry shortcake at Sarabeth’s, we made the most of our visit to the mainland by popping in to Everglades National Park. There were gators everywhere. On our short jaunt on the Anhinga Trail, we easily saw one hundred gators. Gators leered at us, they swam toward us, they growled at us. And, in many places, nothing separated us from those scary guys. We decided it was best for us to keep a safe distance . . . and take our leave before long. But those creepy gator grins stayed with me. 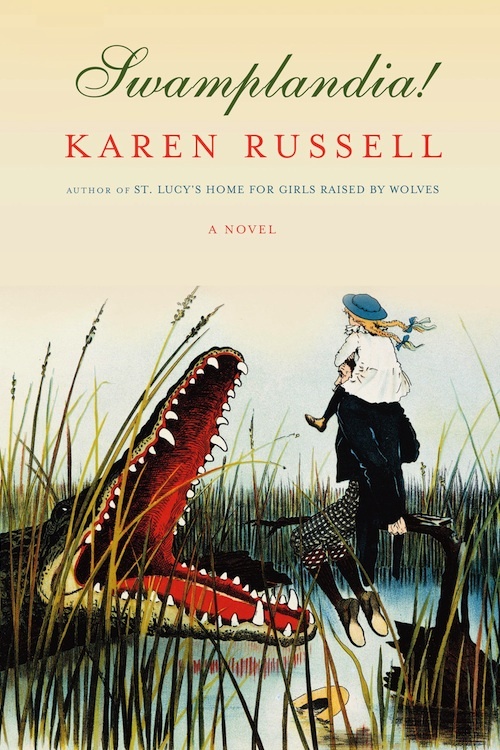 Those gator grins are what sprang to my mind immediately when I began reading Swamplandia!, Karen Russell’s debut novel set in the land of swampgrass and mangroves, egrets and cormorants, gators and cottonmouths. Swamplandia! is the name of the theme park on one of the Ten Thousand Islands where the Bigtree “Tribe” (none of whom is actually Native American) live and work. 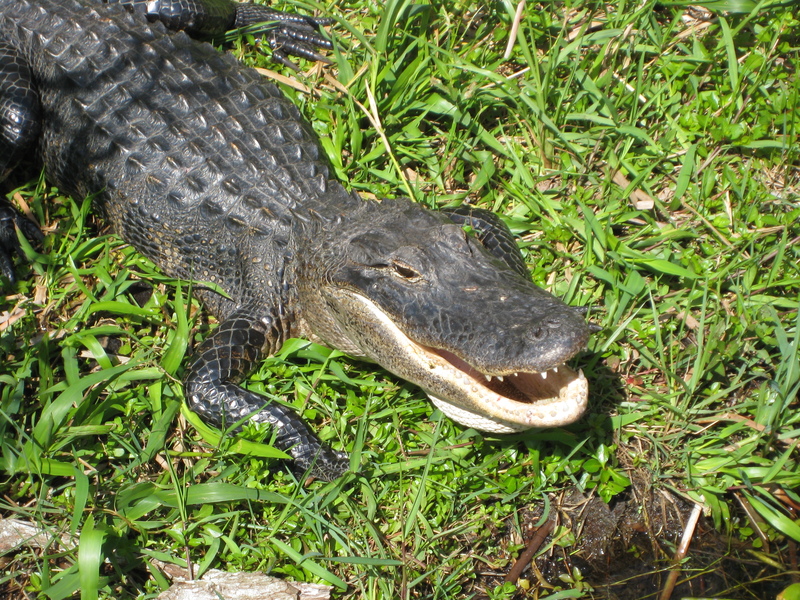 It is the home to dozens of alligators, all of whom are named Seth (the family calls them collectively “the Seths”) and one mammal, Judy Garland (“a small, balding Florida brown bear who had been rescued as a cub by my grandparents, back when bears still roamed the pinewoods of the northern swamp. Judy Garland’s fur looked like a scorched rug—my brother said she had ursine alopecia.”). The family is unique (“Swamp people are this country’s last outlaws.”). There’s Mom, Hilola Bigtree, the world-champion alligator wrestler. Her show, “Swimming with the Seths,” in which she swan dives from on high into a pit of dozens of Seths and swims to safety, takes place daily and is Swamplandia!’s biggest tourist draw. Dad, Chief Bigtree, is a dreamer. He works the spotlight for Hilola’s “Swimming with the Seths” act and trains his kids in alligator wrestling. The three home-schooled kids, Kiwi, Osceola (Ossie), and Ava are all weird in their own special ways. Kiwi, 17, is pragmatic and a genius; he likes using SAT words but pronounces them incorrectly. Ossie, 16, wears a turban, communes with the dead via Ouija board, and dates ghosts. Ava, 13, is a rough-and-tumble tomboy who wants nothing more than to be a world-champion alligator wrestler just like her mom. Unfortunately, things spiral downhill quickly for the Bigtree Tribe. Hilola gets ovarian cancer and dies at 36. Without her “Swimming with the Seths” routine, tourist traffic dries up. Meanwhile, The Chief’s dad, Sawtooth, is stricken with dementia and has to go live in a home. The Chief heads to the mainland in search of salvation (he suggests a fly-by-night plan called “Carnival Darwinism”). Kiwi, sensing that The Chief’s plan will fail, heads to the mainland in search of an education and some cash to save Swamplandia! He heads to work at Swamplandia!’s nearest competitor: a Hell-themed amusement park called The World of Darkness. Meanwhile, Ossie and Ava are left at Swamplandia! to fend for themselves. When Ossie decides to run off to the underworld with her latest ghost boyfriend, Louis Thanksgiving, Ava has no choice but to try to find her, save her, and bring her back. She enlists the help of the gypsy Bird Man (like “avian pied pipers, or aerial fumigators. They call your problem birds out of the trees and send them spiraling over the sloughs; then they wait for them to alight on another person’s property and repeat this service.”), and the two venture deep into the swamp in search of Ossie. I have often heard this book compared to Geek Love , which is one of my favorites, so I had high hopes for it. Russell definitely takes some cues from Geek Love author Katherine Dunne (and, in fact, gives special recognition to her in the acknowledgements). Russell has created an interesting cast of characters . . . but they’re not as unique or complex or endearing as Dunne’s band of misfits in Geek Love. The characters are fun and interesting in theory, but few are well developed enough to make you care very much about them. The book, which is told alternately from Kiwi’s perspective (in third person) and Ava’s perspective (in first person), is outlandish at times, hilarious at times, sweet at times, scary at times. Kiwi’s work at World of Darkness is part coming-of-age tale, part “The Town Mouse and the Country Mouse.” Meanwhile, Ava’s adventure to save her sister is part Journey to the Center of the Earth, part Naked and Afraid (if you haven’t seen this insane reality show, you should watch this clip. For each episode, two “survivalists” volunteer to get dropped in some ridiculous location for twenty-one days . . . with no food, no water, and—hence the title—no clothes. ), and part Nightmare on Elm Street. As these descriptions should suggest, the two story lines read like entirely different books, hastily brought together at the end. We poled under a porch where a bobcat was shouldering through a cracked blue door frame. For a second it paused to look at us. Ancient blue and red flowerpots sat all over the deck, heavy enough to have survived who knows what. I saw spiders, the long absence of flowers. The bobcat slunk around the maze of ceramics, broke free, leapt through a gray space in the porch slats, and easily cleared the six-foot channel between two of the houses, its white belly fur flying above our skiff. The creature landed soundlessly in front of a second doorway, bulled its flat head through the screen, disappeared into another house. All told this took maybe twelve seconds tops. In small doses, descriptive language in Russell’s style and Ava’s quirky 13-year-old voice could have been great to illustrate the weird and creepy world of the Everglades. But, in large doses (of which there are many), it becomes cumbersome and boring. Who should read it: Lindsay (i.e., people who like crazy carnival families like the Geek Love clan and are obsessed with Naked and Afraid). This entry was posted in Rating: 3/5 and tagged Ava Bigtree, Book review, Book Reviews, Books, Everglades, Karen Russell, Swamplandia!, Swimming with the Seths. Bookmark the permalink.